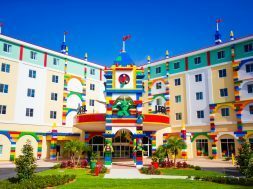 LEGOLAND Florida Resort has officially opened its latest expansion at its resort in the shape of 83 colorful bungalows. Each bungalow features 166 separate rooms that sleep up to five people, including an area just for kids with a bunk bed, trundle bed and privacy curtain, you know, because kids need their alone time too. The bungalows also feature several great amenities themselves, including TV, mini refridgerator, and multiple USB charging plugs throughout the bungalows. Each “cove” of bungalows features its own playground located just outside for the kids to enjoy. Also located just outside of the entrance of your bungalow is a small and cozy front porch area for the parents to relax on while their kids play in the nearby playground. Other amenities at the LEGOLAND Beach Retreat include Sandy’s Castle Restaurant, which features both a breakfast and dinner buffets for guests to enjoy. Breakfast buffet is included with each night’s stay. Connected directly to Sandy’s Castle Restaurant is Sandy’s Beach Bar, which features both alcoholic and non-alcoholic drinks, so both families can enjoy a fun beach-themed beverage. There are also a variety of made-to-order food options available at the bar, including pizza to-go. There’s a gift shop located just inside the entrance of the restaurant area called Palm Tree Traders, which offers a variety of LEGOLAND and LEGO products for guests to purchase. On-site transportation is also provided for guests at LEGOLAND Beach Retreat to and from LEGOLAND Florida theme park. 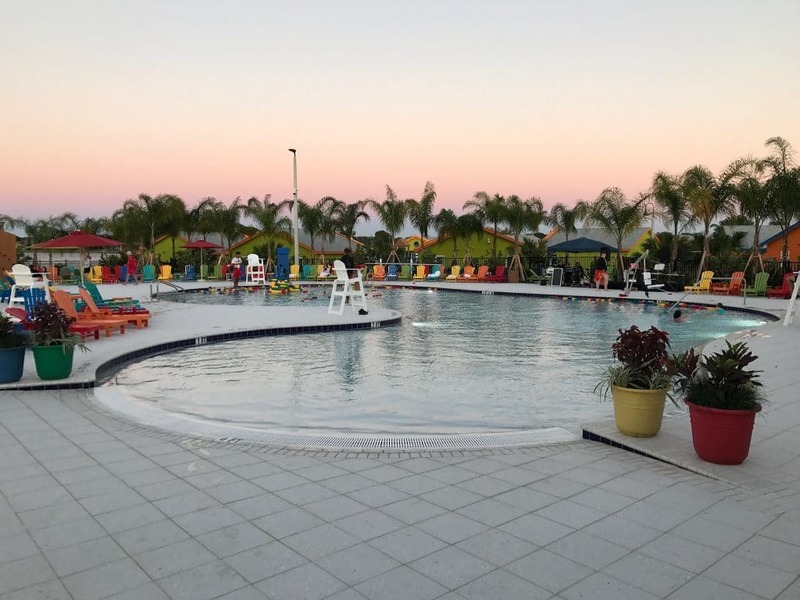 The pool is located just outside of the restaurant and gift shop and features a zero-entry setting and of course, lots of giant LEGO bricks for kids to build with while they swim in the pool. The pool area also features a playground, games, and plenty of room for the parents to relax. The LEGOLAND Beach Retreat comes just under two years since the LEGOLAND Hotel at LEGOLAND Florida Resort opened its doors, which was back in 2015. The LEGOLAND Beach Retreat offers similar amenities as the hotel but in a much more quiet and relaxing setting for families to enjoy. 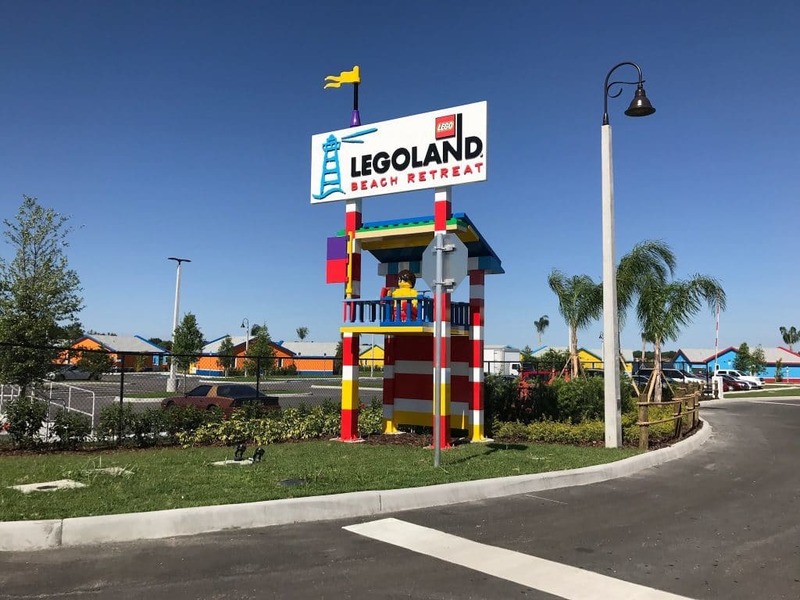 The area in which Beach Retreat was built on sits just across the road from LEGOLAND Florida Hotel & theme park, on the shores of Lake Dexter. Room rates for LEGOLAND Beach Retreat start at $135 per night (plus tax and resort fee) and vary by season, date and availability. There are also packages available, that include both your resort stay and LEGOLAND theme park tickets. 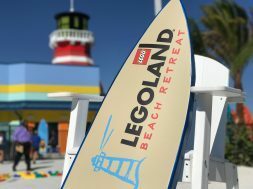 Be sure to check out our full photo gallery from the grand opening of the LEGOLAND Beach Retreat below. previous New ride concept for Harry Potter, Nintendo, or something else? next Volcano Bay: What to do first?